Why is 5 Star Different? What makes 5 Star's Wool different than that of other pads? 5 Star uses only 100% pure virgin wool in the manufacturing of 5 Star Saddle Pads. They are made with the highest quality F10 Rated Pure Wool Felt available and is made with heat and pressure (never needled) with a Compression rating of 6.0 to 7.0 PSI and a Tensile strength of 200 PSI. The qualities of wool allow it to remove heat by wicking away sweat thus cooling your horse. 5 Star felt protects against pressure points on your horse's back! 5 Star pads will maintain this strength and quality for 2,000+ hours of riding time with proper care! The compression ratio of 5 Star 100% Pure Virgin Wool Felt is 6.0 to 7.0 PSI. This means that it protects against pressure points at a rate of 6 to 7 pounds per square inch. Tensile strength is the ability of the wool felt to stand up to tearing apart or separating. 5 Star's Industrial grade F10 100% pure virgin wool felt can withstand 200 pounds per square inch before it begins to break apart or separate. How long will 5 Star felt last? 5 Star's supreme quality, industrial grade, 100% all-natural, pure virgin wool felt is manufactured with heat, steam and compression. This process insures that 5 Star pads are built to last with proper care. 5 Star's compression ratio of 6.0 PSI and a Tensile Strength of 200 PSI allows it to maintain the highest standards for 2,000+ hours of riding time. We have 5 Star customers that with proper care still use the same pad that they purchased 12 to 15 years ago! Have you tested the performance of your 100% All-Natural Pure Virgin Wool Pads? Our felt has been tested by a 3rd party and has been given the industry standard rating of F10. International Felting Standards shows that the F10 felt has a compression rating of 6 psi and 200 psi tensile strength as opposed to compression rating of 2 psi and 75 psi tensile strength for the F15. Additionally, based on research from Felt Manufacturers Council of America, the higher the virgin wool content of the felt, the better the wicking ability is. How does your pad help cool a horse's back? The properties of 100% Pure Virgin Wool Felt allow it to wick 20X its weight in moisture which in turn removes heat. Wool breathes and doesn't trap heat like synthetics. 5 Star uses no synthetic and no gimmicks in the manufacturing of our All-Natural Wool Saddle Pads! Where are 5 Star 100% Pure Virgin Wool Pads and 100% All-Natural Mohair Cinchas made? 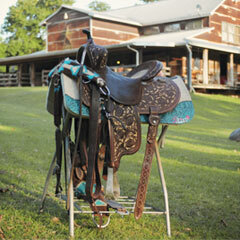 5 Star Pads and Cinchas are handmade in the beautiful countryside of Hatfield, Arkansas. Do you make English Pads? Yes, we do carry a selection of English Styles made with the same great benefits of our F10 Grade 100% Pure Virgin Wool Felt. View our many different English Pads. 5 Star recommends that your saddle pad stick out 1"- 2" in both the front AND the back of your saddle skirts. If you have more than 2" of pad sticking out, the felt can begin to curl up overtime causing it to become abrasive. 7/8" - best all-around thickness for regular use. 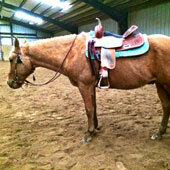 Recommended for trail riding, team penning, cutting, reining, and barrel racing. Minimum recommended thickness for gear/rider weight combinations of 200 lbs. or more, or for rides of more than 4 hours at a time or over rough terrain. 1" - best for heavier riders or for especially long or hard use. Designed with ranch work in mind, for roping, performance, colt starting or heading to the mountains with lots of gear. 1 1/8" "Supreme Roper" thickness - Specially engineered for team roping, calf roping, steer stopping and performance. How long will you be riding? If you ride more than four hours at one time on a regular basis, you need a pad that is at least 7/8" thick. How much do you weigh? If you and your gear together weigh more than 200 lbs., you should get at least a 7/8" pad, but a 1" would be better. What kind of terrain will you be riding on? If you regularly ride over mountainous or hilly areas, again, you want at least a 7/8" thick pad, but 1" would be better. Choose a skirt shape that complements your saddle skirts. What is different about the mule contour? The mule contour uses a gentler curve along the spine, and has a wider profile over the shoulders to allow for the mule's unique wither and body shape. Would a low wither/mule contour be better for my mutton-withered horse? The low wither/mule contour is ideal for the flat backed, wide shouldered horse that has little to no wither. It also works great for the unique body shape of mules. However, please be sure that you truly do have a low withered horse, or you may be frustrated with your pad not conforming well into the dip of your horse's back. 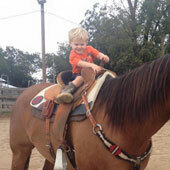 If you are not certain, email us a photo of your horse's top line and we will assist you in making the decision. My horse has prominent withers. Will 5 Star's Horse Contour work? Most of the time, the normal horse contour will work, even for horses with fairly high withers. However, for animals with high withers that really do need extra clearance, 5 Star recommends the no-gullet hole option, as this allows the contour to continue up and over the wither thus allowing for a higher clearance over the withers creating no pressure in the wither area. We also offer the flex fit cutout option for extremely high withers and for performance horses and trail riding. The wither area is cutback creating no pressure over the withers and allowing the pad to curve down into the unique back line of an extremely high withered horse. This option is great for horses with muscle atrophy as well. Please email us a photo of your horse's top line if you think that this might be the best option for you. Why does my horse have marks along the bottom edge of the pad? 5 Star offers a PH Neutral Saddle Pad Cleaner that is safe for your 100% PURE wool saddle pads! Surface Cleaning: Remove excess hair with a 5 star sponge or a rubber curry comb. Thoroughly wet your 5 Star Pad with warm water if available. Spray cleaner directly on underside of saddle pad until completely wet. Allow to set up to 30 minutes then brush crust & hair away before rinsing well with a water hose using gentle water pressure (do not use pressure washer). (8-10 hours). Agitate periodically to work solution into pad fibers. Rinse under gentle water pressure. Allow to air dry. Always spot test first on a small, inconspicuous area if being used on a sensitive fabric or surface. CLEANS 4-6 Pads per bottle. Why does my horse have rub marks on its back or hip? If your pad extends past the front or back of your saddle more than 2", it can begin to curl up over time and become abrasive. 5 Star only recommends 1" to 2" of pad sticking out around your saddle in both length and width. Why does my pad slide? Most often we find that when your 5 Star Saddle Pad slides, it is due to poor saddle fit or from using a horse contoured pad on a flat or low withered back. If your pad is too thick, it can sometimes cause sliding as well. For a personal consultation, call us at 870-389-6328. My horse has pockets or a sway back, what should I do? 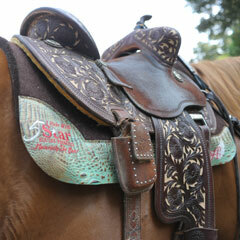 If your horse has a sway back, you should choose a pad of at least 1" to 1 1/8" thick with the flex fit wither relief. This allows the pad to flex and contour into your horse's unique backline. We also have shims available for extreme backlines. For a personal consolation, please call us at 870-389-6328. My horse's back is sore, will a 5 Star Pad help? 5 Star's industrial grade 100% all-natural pure virgin wool has a compression ratio of 6.0 PSI and a Tensile Strength of 200 PSI which allows the weight to be dispersed away from pressure points on your horse's back. The qualities of wool allow it to wick moisture, up to 20X its weight, and remove heat away from your horse. 5 Star pads are contoured and do not slip. They will continue to conform to the shape of your horses back with repeated use. 5 Star Equine's 100% All Natural Pure Virgin Wool Pads offer the BEST PROTECTION for your horse's back! 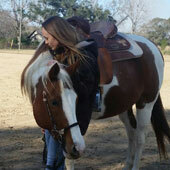 Although 5 Star provides the best protection for your horse's back, it will not completely resolve a saddle fit issue. Why is a thicker pad better? 5 Star pads range in thickness from ½" to 1 1/8" thick! The thicker pads have "more of the good stuff" between your saddle and your horse's back! If you are unsure what thickness to get, call us at 870-389-6328. When should I choose a Self-Contouring pad? For the 1/2" Self-Contouring English skirt pad. For Treeless saddle pads, which we will only sell in 7/8" and 1" thicknesses. In this case, the self-contouring spine keeps pressure off the spine of the horse from the rider's weight, as there is no tree in the saddle to do so. The self-contour also helps keep the treeless saddle from rolling side to side. 5 Star does NOT recommend using the Self-Contouring Pad in saddles with a tree. 5 Star reccomends a standard horse contour as the best option under treeless saddles before trying a self-contouring pad. Can 5 Star Pads be used with a treeless saddle? Yes! A standard 5 Star pad works perfect under a treeless saddle, however we have designed a self-contouring treeless pad to be used with treeless saddles. It can only be purchased in 7/8" or 1" thick wool. It is designed to transfer weight from direct impact on top of the spine down to the sides. Will you take custom orders? Yes, we do take custom orders. Each pad is hand made with many different options available for you to customize your one of a kind 100% Pure Virgin Wool Saddle Pad. 5 Star's 100% Virgin Wool comes in natural, cinnamon brown, dark chocolate and black. We offer three different wear leather lengths: Regular Length, Full Length and Custom Full Length. We offer 5 basic wear leather colors that you can choose from at no additional cost. They are Brown, Dark Brown, Aged Bark, Latigo and Black. We offer a large selection of different stamped and hair on wear leathers for a unique and personalized look for an additional fee. Standard or Custom Embroidery is available. If you don't see the design that you want on our website, call us at 870-389-6328. We can digitize your artwork and embroider it on a circle, diamond, or modified triangle leather patch or directly on your custom full length wear leather. If you don't see what you want on our website, call us at 870-389-6328. We can hand cut, hand tool and hand paint a pad and wear leather to your specific specifications! You can customize your pad online, or call us to order your pad today at 870-389-6328. Can you embroider my brand? Yes, we do custom embroidery and can digitize your artwork for an additional digitization fee. If you don't see a standard design that you want online, call us at 870-389-6328, we may have the design in our library. If we don't have it, we can create it! Can you make a 5 Star Pad to fit my saddle? 5 Star's 100% pure virgin wool felt can be custom cut to your exact specifications! Measure your saddle length and width, or trace an outline of your saddle onto a sheet on your horses back and send us the template. We will be happy to work with you on your custom pad! What are your basic or standard wear leather options? We have 5 standard wear leather options available at no additional charge. Brown, Dark Brown, Black, Aged Bark and Latigo. What type of leather do you use for your standard or basic wear leathers? Why do the patterns vary so much in your cow hides? 5 Star only uses real hide from real cows thus creating a natural variance in colors and patterns from one hide to the next. What color pads are available? 5 Star's 100% pure virgin wool felt comes in natural, cinnamon brown, dark chocolate, black, pink, purple, turquoise, red, or royal blue dyed with all-natural vegetable based horse and environmentally safe dye. There is the potential (although we have not had any complaints) of the bright dyes bleeding onto your horses' back initially. If this arises, it should subside after a few uses. This would be more noticeable on a light colored horse and is perfectly safe as the dye is an all-natural vegetable based dye that is safe for both you and your horse. We do have pad liners available that can be placed between the pad and your horse if this is a concern. Not all colors available in every thickness. Black Pad - Brown Leathers: 1/2", 3/4", 7/8", 1", 1 1/8"
Cinnamon Pad – Aged Bark Leathers: 3/4", 7/8", 1"
Dark Chocolate Pad – Aged Bark Leathers: 1/2", 3/4", 7/8", 1"
Natural Pad – Dark Brown Leathers: 1/2", 3/4", 7/8", 1", 1 1/8"
Purple - Oro Russet Leathers: 3/4", 7/8"
Red - Dark Brown Leathers: 3/4", 7/8", 1"
Royal Blue - Oro Russet Leathers: 3/4", 7/8", 1"
Pink - Dark Brown Leathers: 3/4", 7/8"
Turquoise - Aged Bark Leathers: 3/4", 7/8"
Why is there a price difference between "Natural" items and the other colors? Natural felt and cord has been processed much less than dyed ones. Therefore, when you purchase a dyed product, you are paying for the materials and labor that went into creating it. The brightly colored dyes are more expensive therefore the price of the pads will also reflect this cost. When should I use a pad liner? 5 Star does not recommend double padding, however if you need to protect your investment (especially during springtime shedding), we offer a pad liner in the lower grade F15 felt to keep costs down. This liners are inexpensive and easily replaceable. They are also good to use during changes to your horse's comfirmation. They come in either a 30" x 28", 30" X 30" or 32" X 32" and can be ordered in custom sizes by calling 870-389-6328. Why are your pad liners and Cinch Savers made with a lower grade F15 Felt? The 5 Star Pad Liners and Cinch Savers are made with an F15 felt to keep costs down as they are simply used to protect your investment especially during spring time shedding. Rest assured that the F10 grade 5 Star pad that you use will bond to the liner and continue to wick up through the liner both absorbing moisture and cooling your horse. The bond creating between the pad and liner will prevent slipping. Why do you include a free rubber sponge with every order? How often should I brush my pad? Every 5 Star 100% Pure Virgin Wool Saddle Pad comes with a rubber sponge to keep your pad clean. We recommend that you brush your pad in a circular motion after every ride to remove dirt, hair and debris. Your pad can be cleaned both damp and dry after a ride. How and when do I clean my 5 Star 100% Pure Virgin Wool Saddle Pad? Every 5 Star 100% Pure Virgin Wool Saddle Pad comes with a rubber sponge to keep your pad clean. We recommend that you brush your pad in a circular motion after every ride to remove dirt, hair and debris. Your pad can be cleaned both damp and dry after a ride. When your pad starts to get hard areas of dirt and dried salt, it is time to wash your pad. We recommend hanging your 5 Star Pad by the gullet hole and washing it with either Woolite ® or a horse safe shampoo and a water hose. Wash from the top down, make sure you remove all traces of soap, and let your pad dry completely before use. Never lay your 5 Star pad on its back to dry as the lacing can come undone. RECOMMENDED CARE INSTRUCTIONS can be viewed at 5 Star Pad Care and Cleaning. When is it time to replace my 5 Star 100% Pure Virgin Wool Saddle Pad? If your pad has lost its compression, and you don't feel like has the same protection that it did when your pad was newer, it's time to replace your pad. How long will it take my item to get here? Please see the Shipping and Deliveries Section on our Shipping Page. Can I buy directly from the manufacturer? You can order directly from 5 Star Equine Products online or via telephone by calling us at 870-389-6328. Do you have any dealers near me? Our dealer locator can be found here. Enter your address to find a dealer near you! 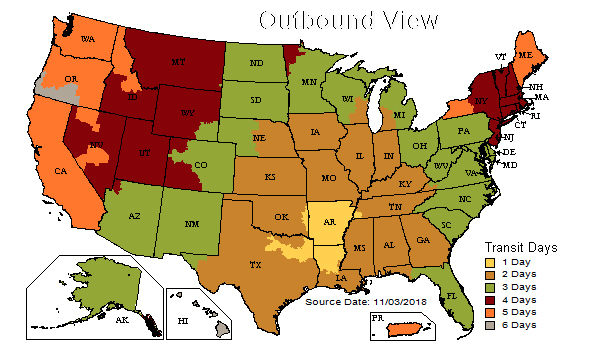 5 Star Equine Products ships internationally and has dealers worldwide! Check out our shipping page or our dealer locator to find out how to get 5 Star Pads in your country. Can I return my 5 Star 100% Pure Virgin Wool Saddle Pad? How do I determine my cinch size? What colors of 100% All-Natural Mohair Cord do you carry? Candy Stipe (twisted strands of mohair into one mohair cord): 2 Black/1Natural/1Sorrel, 2 Black/2 Natural, 2 sorrel/2 Natural, 2 Brown/2 Natural, 1 Red/1Black/2 Natural, 2 Red/2 Black. What style of cinchas do you make? Tied cinchas are the traditional flat cinchas with a single layer of mohair cord and can be created with 17, 19, or 21 strands. The 17 and 21 strands have the center "D" rings attached with nylon webbing. The 19 strand has "tied in" center "D" rings attached with mohair cord. Each cord is approximately 1/4" in width, so cinch width varies according to the number of strands. Tied-woven cinchas are a combination with tied ends and woven "bars". They have either 30 or 31 strands and have a leather latigo keeper on the off side. They can only be created with mid bar style buckles. What patterns do you have available for your 5 Star 100% mohair Cinchas? Cinchas are available in natural, solid color, pinstripe (alternating strands of 2 different colors), or candy stripe (created using 1 cord of twisted colors). You can also add half diamonds, whole diamonds or diamonds with trim for a custom look. We also offer the traditional Vaquero style cinchas with diamonds, bars, bells, and a shufly tassel! For custom orders, call us at 870-389-6328! What kind of buckles do you use on your 5 Star 100% mohair Cinchas? 5 Star Cinchas are made using flat buckle hardware to prevent pinching. They are available in solid stainless steel or brass and will never rust. What are the benefits of mohair on 5 Star 100% mohair Cinchas? Mohair refers to a silk-like fabric or cord made from the hair of the Angora goat. Mohair is a wool-like fiber that has a lot of the same great all-natural properties as 100% Virgin Wool. 5 Star uses only the finest 8 ply mohair available, twisted with minimal tie breaks and consistent tensile strength allowing for a comfortable fit with less cinch soring, no sweat galling, and no strength deficit. 5 Star 100% All-Natural Mohair is spun using no synthetics and is dyed with all-natural vegetable based dyes that are safe for your horse. Please note, it is possible for the colors from the dye to leach onto your horse, but it is perfectly safe. The natural mohair is not dyed and is the color that comes from the Angora goat. For more information on Mohair, please read the article Why Mohair? Article. What is the purpose of the y-cincha? This unique combination front and back cincha does not put any pressure on the back of the rib cage and stomach barrel. When a standard back cinch is tightened enough to hold the back of the saddle in place, it constricts the horse's ability to expand its rib cage when breathing deeply. The Y cincha brings all the pressure forward to where the front cinch already is. 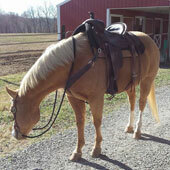 Thus, the back of the saddle is stabilized with no pressure on the rib cage or stomach barrel. This can be the key to finding that extra edge for riding performance! How long will a 100% Mohair Cincha last? 5 Star Equine's 100% Mohair Cinchas will last many years with proper care. The 100% Stainless Steel or Solid Brass Hardware will not rust. When your cinch becomes dirty or begins to rub your horse, it is time to clean your cinch. You can soak it in a Woolite ® Solution or use a horse safe shampoo. After soaking, rinse your cinch thoroughly and hang to dry, repeat if necessary. Do you make 100% Mohair Breast Collars to match my 5 Star Cinch? Yes, we do make breast collars. 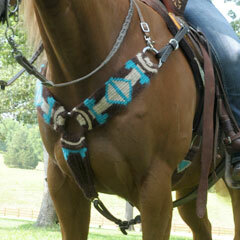 They are made with the same great cord and buckles as our cinchas and are available in matching designs and colors! The standard breast collar size is 36", but we can custom make one to your specifications. Call us at 870-389-6328 to order yours today. Do you make Cinch Covers/Protectors? Our Cinch Saver comes in either the roper or cutter style, and it is made of F15 grade felt. Always remember to keep your Cinch Saver clean to avoid the felt becoming abrasive. My question is not addressed here, what should I do? We would be happy to assist you with any and all questions! Please call us at 870-389-6328 or email us and what of our representatives will get back to you as soon as possible. We guarantee and stand behind all of 5 Star’s workmanship. We also stand behind the 100% Virgin Wool felt. We will replace unsatisfactory workmanship or defects in felt due to the manufacturing process or the assembly of the 5 Star pads. We will not stand behind the felt or workmanship if it has not been cleaned or cared for as we have recommended.